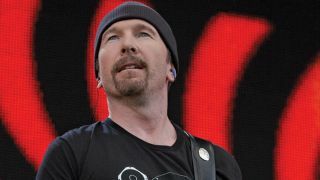 The Secrets Behind The Edge's Guitar Tone on U2's "Vertigo"
Learn how The Edge got his monster tone on U2's 2004 smash hit. U2 have unveiled "You're the Best Thing About Me," the charged lead single from the band's upcoming album, 'Songs of Experience.' Listen here. Fender Musical Instruments Corporation (FMIC) is proud to introduce The Edge Signature Stratocaster and The Edge Deluxe amplifier to its signature series collection. U2 are releasing a new double-disc live album, U22, which was recorded during their U2360° tour. U2 will be marking the 20th anniversary of Achtung Baby with a deluxe reissue package. In this clip from the soon-to-be released feature film It Might Get Loud, The Edge shows how his effects color his distinct sound. In this clip from the soon-to-be released feature film It Might Get Loud, the guys tell the stories behind their first guitars. In this clip from the soon-to-be released feature film It Might Get Loud, Jack White and The Edge give a glimpse into their weird worlds of gear. As U2's innovative guitarist, The Edge is no stranger in taking risks. Here, he reflects on his 25 years with rock's most musically adventurous and life-affirming band.